Edamame, a large-seeded soybean that grows in pods, is a traditionally Asian crop that grew in popularity during the 20th century and is now an important U.S. crop. People have eaten soybeans for nearly 5,000 years, and edamame is one of the few legumes high in protein. While the legume is often added to soups, stir fry dishes and other recipes, eating it as a nutritious snack is one of the most common methods. Edamame is usually sold in whole, frozen pods, though you may be able to purchase fresh pods as well. 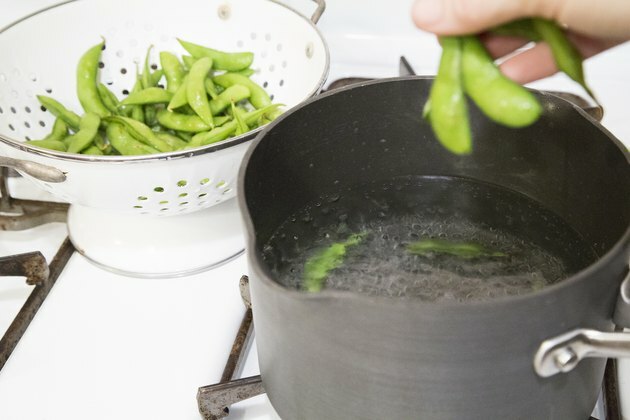 Fill a pot with water and a pinch of salt and boil, adding the pods to the water and allowing them to boil for three to five minutes, stirring them occasionally. Drain the cooked pods and place in a bowl of cold water for two to three minutes before straining out the cool water and eating. 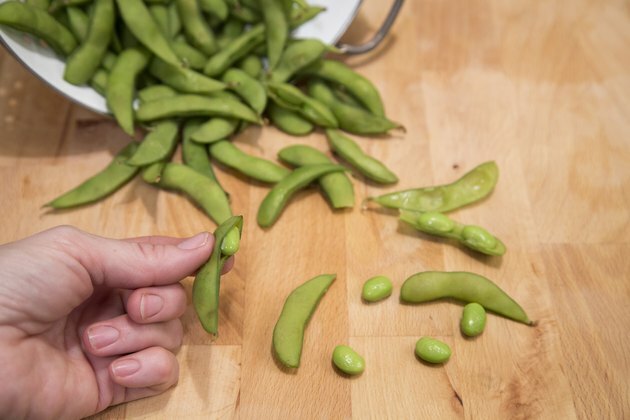 To eat cooked edamame plain, squeeze the edge of the pod between your thumb and forefinger. This will allow the whole bean to pop out of the pod into your mouth. Discard empty pods. Alternatively, squeeze the beans out of the pods and add them to a small side salad for a mid-afternoon snack. If you're a fan of chips and dip, try making an edamame hummus to eat on small pieces of whole wheat pita for a healthier alternative. 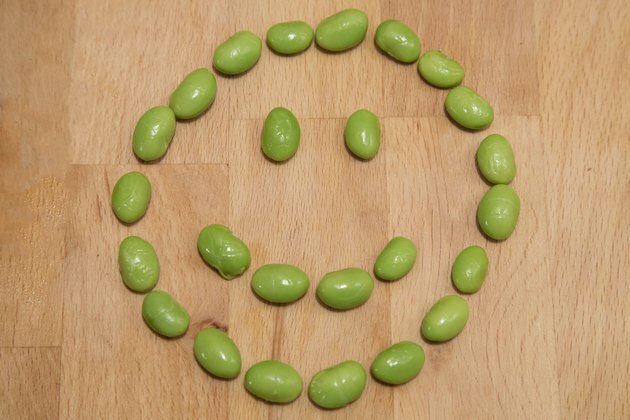 Blend shelled edamame with tahini, water, olive oil, garlic, salt and cumin for a tasty dip. One of edamame's biggest benefits as a snack is the protein it contains, which is equivalent to protein found in many animal food sources. Consuming 25 grams of soy protein per day can help lower your risk of heart disease because soy can help lower cholesterol, according to the U.S. Food and Drug Administration. 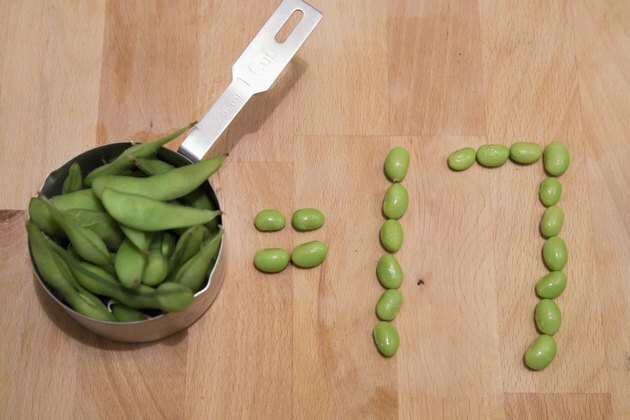 Just 1 cup of frozen, prepared edamame contains 17 grams of protein with only 189 calories. 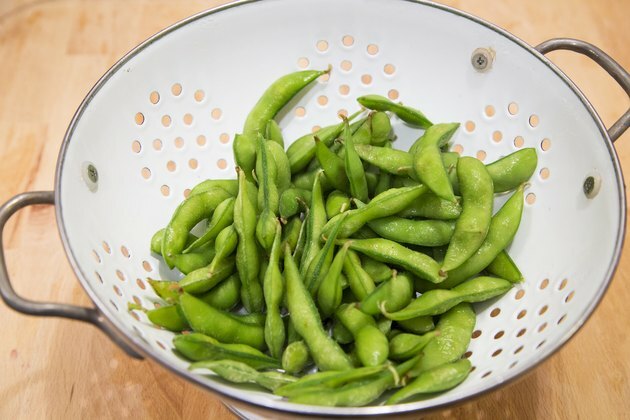 Protein-rich snacks help you feel full longer than sugary choices, making edamame a good choice if you're trying to lose or maintain your weight. Edamame is a rich source of many other nutrients. A cup contains 52 percent of the daily value of Vitamin K, 79 percent daily value of manganese, and a whopping 121 percent daily value of folate based on a 2,000-calorie diet. Each cup also contains about 8 grams of dietary fiber, important for healthy bowels and controlling blood sugar levels. CNN Health: What Exactly Does Fiber Do? Are Edamame Beans Healthy for Women?